I will NEVER decline a well done fairy tale (or even classic novel) retelling, especially when in graphic novel/manga form. I think it allows the material to be much more consumable for most young audiences, and adds new compelling components to the original story. That’s what we had here! The Pied Piper was already a pretty dark story. It was one of those fairy tales that never had a bright and happy Disney retelling that took over in the public eye. It has always been… creepy. I loved how this graphic novel approached that. It gave the characters dynamic, reason, and a compelling plot that the original story didn’t have too much of (as it is mostly seen in a simple fairy tale form). 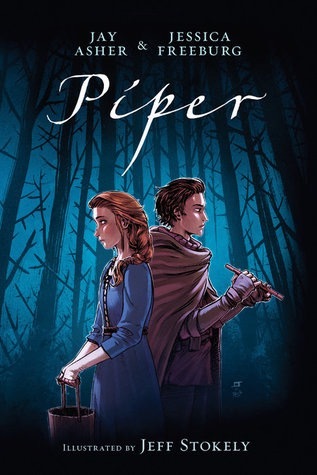 This graphic novel also covered, though very briefly, the fact that the pied piper is supposedly a true story, which I find fascinating all together (hit me up if you ever want to discuss the facts behind the pied piper OR Peter Pan (which are suspisingly linked)). This is one of those books that really makes you question the seemingly black and white idea of fairy tale villains versus heroes. There were some very dark themes covered in a very unique way in this graphic novel—it all helped the plot and didn’t make the story itself seem heavy. Reading it broke my heart, like honestly just give these poor people a break haha. But it was exceptionally thought provoking. The art was also GORGEOUS. Fantasy graphic novels like this are not nearly popular enough, I need more of them in my life. Honestly, I picked it up because I thought the cover and character art were just gorgeous—the rest of it is too! There is absolutely no shame in just picking up this book because it’s beautiful, for it most certainly is. If you’re interested in exploring some fairytale retelling and a little graphic novel, definitely check this out! It’s a quick read, but totally work reading.